The Evil Queen has, quite literally, captured the Huntsman's heart -- and now he's her slave. Based on the world of ABC's hit primetime series ONCE UPON A TIME, this is the never-before-told tale behind their twisted relationship -- and what happens when a good man is forced to do bad. 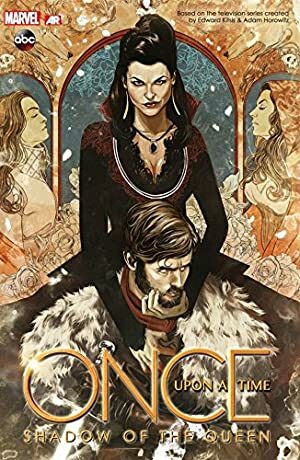 When Regina cooks up yet another devious plan to capture Snow White -- this time by allying with a pack of power-hungry werewolves -- the Huntsman comes face-to-face with his past... and an independent spirit in Red Riding Hood that just may match his own. Can these two break free of the forces that bind them and save Snow White? When put to the test, where will the Huntsman's loyalties lie? Has the Evil Queen stolen his heart in more ways than one? Log In to track Corinna Bechko on eReaderIQ. to be notified each time the price drops on any book by Corinna Bechko. to stop tracking Corinna Bechko. Log In to track Dan Thompson on eReaderIQ. to be notified each time the price drops on any book by Dan Thompson. to stop tracking Dan Thompson. Log In to track Mike Del Mundo on eReaderIQ. to be notified each time the price drops on any book by Mike Del Mundo. to stop tracking Mike Del Mundo. Log In to track Mike Henderson on eReaderIQ. to be notified each time the price drops on any book by Mike Henderson. to stop tracking Mike Henderson. Log In to track Stephanie Hans on eReaderIQ. to be notified each time the price drops on any book by Stephanie Hans. to stop tracking Stephanie Hans. Log In to track Vasilis Lolos on eReaderIQ. to be notified each time the price drops on any book by Vasilis Lolos. to stop tracking Vasilis Lolos. We started tracking this book on September 25, 2013. The price of this book has changed 65 times in the past 2,036 days. The current price of this book is $19.99 last checked one day ago. This lowest price this book has been offered at in the past 90 days is $9.99. The lowest price to date was $2.60 last reached on April 14, 2014. This book has been $2.60 one time since we started tracking it. The highest price to date was $19.99 last reached on March 23, 2019. This book has been $19.99 4 times since we started tracking it. We last verified the price of this book about one day ago. At that time, the price was $19.99. This price is subject to change. The price displayed on the Amazon.com website at the time of purchase is the price you will pay for this book. Please confirm the price before making any purchases.